The Passchendaele Society, with the cooperation of the Field of Remembrance Trust (FoRT), installed a field of 846 named crosses in Auckland Domain in front of the Auckland War Memorial Museum during the month of October in memory of all who died during the Passchendaele Offensive (Battle of Broodseinde from October 4th and Battle of Bellevue Spur from October 12th). I hope you may have had a chance to visit the field of crosses. The work involved in making, personalising, installing and removing the crosses is quite considerable indeed and FoRT are to be highly commended for their dedication to this in order that the boys who still lie on foreign soil are never forgotten! Progress on the New Zealand Memorial & Garden at the Zonnebeke Chateau near Passchendaele is progressing along very nicely. A letter from the President has just been sent updating members on the latest developments. The site will undoubtedly become the focal point for future commemorations. The Hon. Maggie Barry MP, Minister for Arts, Culture & Heritage visited Flanders in October to unveil the new Memorial at the bottom of Bellevue Spur dedicated to all those that lost their lives during the Passchendaele Offensive. The monument is a large scale version of the Nga Tapuwae sign as seen on the Wellington waterfront and depicts the battlefield as viewed from that spot on October 12th 1917 – to recap the New Zealand Division’s involvement in the push towards the village of Passchendaele resulted in our worst day in Military history recorded on 12th October 1917 when we lost 846 of our men on Bellevue Spur on just one day during the Passchendaele Offensive! A similar Memorial was also unveiled that overlooks the Messines battlefield. Mrs Barry also attended a special Memorial service for Dave Gallaher at Nine Elms Cemetery near Poperinge. The Defence Blacks also attended the service. She then proceeded to our Memorial & Garden plot to plant a New Zealand flax, the first of many that will soon be planted! John Key also visited Tyne Cot Cemetery (but not the New Zealand Memorial & Garden) while he was in Belgium to present an Honorary Member of the New Zealand Order of Merit to our own Freddy Declerck. We are confident he will do so on his next visit to Belgium! Portia Baine from Sacred Heart Girls College in Hamilton was this year’s worthy winner of the annual Veterans’ Affairs ‘Why Should We Remember Passchendaele?’ competition. She was presented with their prize by a very enthusiastic Minister for Veterans’ Affairs Hon. Craig Foss MP at our annual commemoration on October 12th. She read her winning poem titled “Passchendaele” to the attendees which was received with enthusiasm. You can read her poem here http://passchendaelesociety.org/competition/ . I am pleased to announce that Portia has accepted the invitation to become our latest Youth Ambassador for the Passchendaele Society. The AB608 1915 steam train named Passchendaele recently toured the South Island between October 19th and November 2nd from Picton to Kaikoura then on to Christchurch, Oamaru, Dunedin, Invercargill, Bluff, Middlemarch, Greymouth and Westport. Restoration of the Passchendaele began more than 20 years ago and cost $500,000 to restore! 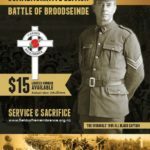 Our members are encouraged to support this initiative if there is a future opportunity as it is a great way to raise awareness about the events that took place at Passchendaele! Numbers were down a little this year as the anniversary fell on a Monday, but was still very well attended. We require the help of members to help raise awareness about Passchendaele now that we are able to come out from under the shadow of the events that took place at Gallipoli. We are often asked if we know of any New Zealand specific tours going to the Western Front. We have been informed of several arranged by Innovative Travel (more for the non-historian type traveller wishing to see where their ancestors fought) and the more in-depth but ‘casual’ self-drive tours run by Tagalong tours with Herb Farrant as your personal guide (more for the historian type traveller wishing to learn as much as possible). Dates for each tour are best sourced from them directly – there are tours planned in 2016, 2017 and 2018. Visit Innovative’s website for more information (or just email them to let them know what dates/anniversaries you are interested in). For Tagalong, email Herb on herb@pcis.co.nz Please note that the Passchendaele Society does not endorse these tours as such and does not receive any financial or other benefit from them. Please let us know if you hear of any other tours so we that can update our list. Commemoration ceremonies are of course planned for Auckland by the Passchendaele Society and Wellington by the New Zealand Government – plus other ceremonies will be planned I am sure at other centres such as Dunedin and Christchurch, so one does not ‘have to’ go to Europe of course! Greg Hall is currently the Minutes’ Secretary at Board meetings and Sandi Notredame is currently the E-News editor. She has also taken on the role as Web Administrator with the help of her daughter Summer who as a ‘younger generation’ member was very quick to get a Passchendaele Society Facebook page up and running! You can find us on facebook.com/Passchendaele-Society and of course ‘like’ the page and/or follow the page! This will help us to raise awareness about Passchendaele, especially amongst the younger generations! The following book was published this year and may be of interest to members because of the involvement of the Pacific Island. The volunteers that served with the Maori Pioneer Battalion were trained at Narrow Neck in Devonport. Weddell, Howard: Soldiers from the Pacific: The Story of the Pacific Island Soldiers in the NZEF in World War One. The author welcomes updates and corrections to the material of the book and may be contacted by email via www.soldiersfromthepacific.com Copies of the book can also be obtained through that website.